My mom rented a cabin the beginning of October in West Yellowstone and mom, Ben, me, Jon, Michael, Joe and all of our families came up to enjoy one of the best weekends that I have had all year! (We missed Sara's family and Tim!!!) What a special time to spend with each other and to have such happy times together. A lot of our times spent together this year have been centered around dad and him being sick and then with the funeral. It is nice to get together with no agenda in sight and just to be there with family. The cabin was so nice and roomy for our huge troop and we couldn't have asked for any better weather. It was perfect!!! We went into the park a few times and were able to see some fun stuff, take a really nice hike, and even got a little too close to a buffalo!!! Nothing that I hadn't seen before, but it was different this time. I had a friend say the other day that you really can only go to Yellowstone every once in a while because there are only so many times that you can see Old Faithful and the painted pots. I agree a little bit, however, this trip was a little different for me because the last time I was at Yellowstone I was with Dad. I miss him, and I felt like I was a little closer to him and some memories of him than I haven't felt for a while. 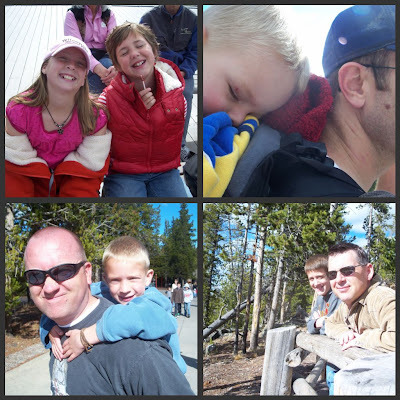 Dad loved nature and the outdoors and he especially loved Yellowstone. While I was there, I thought about him and how he had been there so many times. He never tired of seeing things over and over again and stand in awe of our Heavenly Father's creations. I hope that he was there with us walking along side smiling seeing his family together. That was a nice blog. How did you do that picture at the beginning with 4 in it?? Fun, fun, trip. I am so glad you got to get away with your cute family! Miss you lots & hope all is well.